You may have seen some guitars that have Sapele back and sides or Mahogany back and sides or Mahogany tops but you might wonder what the difference is. So, in the battle of Sapele vs Mahogany, which is the better tonewood? This, of course, as always, depends on your particular tastes – mostly. It should also be noted that Sapele on one guitar (with different materials and construction) will sound different to Sapele on another – and the same goes for Mahogany. You’ve probably heard these two woods compared a fair bit. Usually, when someone asks what Sapele is, the answer is invariably – “it’s like Mahogany”. It is similar to Mahogany, and it’s fair to compare the two because Mahogany would be the closest to Sapele. But they aren’t quite the same thing. To better understand the differences between the two, let’s first take a look at each wood individually. Most guitarists would have heard of Mahogany and it is a very popular back and sides wood and wood for necks. It is also popular as a top wood. Mahogany is quite a broad term. Honduran Mahogany is generally considered to be a better quality tonewood. Honduran Mahogany is a species of wood known scientifically as Swietenia macrophylla. It isn’t as hard as African Mahogany or Sapele. Honduran Mahogany is preferred as a top wood over African Mahogany. African Mahogany (scientific names – Khaya anthotheca, Khaya grandifoliola, Khaya ivorensis, Khaya senegalensis) is harder than Honduran Mahogany and is considered to be the lesser version of Honduran Mahogany. Though to be fair, on most guitars it would be hard to make out the difference in tone when used as back/sides wood. Whether you get Honduran Mahogany (probably more commonly referred to as Tropical Mahogany these days because it is sourced from a number of Central and South American countries now), or African Mahogany, the sound characteristics are going to be pretty close. You’ll likely notice the difference when used as a top wood – but not so much for the back and sides. Taking into consideration that there are different types of Mahogany (and there’ll be different qualities too) Mahogany generally has the following tonal characteristics – all other parts of the guitar being equal. Mahogany’s sound can be described as “earthy” “strong” “beefy”. When used as a back/side wood to compliment a brighter sounding top wood, Mahogany is good for mellowing out the brightness and adding some warmth and a stronger mid-range plus softening the highs and reducing the overtones. Sapele is less heard of than Mahogany. A lot of guitarists, especially new guitarists might not have even heard of it. That said, it is becoming more and more widely used and it will likely be more known as time goes by. That said, it is also sometimes mistakenly called Mahogany, which could also lead to less awareness of this wood. Like Mahogany, Sapele is used as both a top wood and a back/sides wood. Also like Mahogany, Sapele is a popular wood for guitar necks. This is no surprise given that it’s quite a hard wood but is still easy to carve. It’s harder than both Honduran and African Mahogany. Sapele comes from West Africa and its scientific name is Entandrophragma cylindricum. Again, like with Mahogany, the sound that you can expect from a guitar with Sapele will greatly differ depending on other materials used, the builder, and whether or not it’s used as a top, back and sides or both. All else being equal, Sapele will be a lot like Mahogany, to be fair, but with some subtle differences. But this is only a subtle difference really. Enough so that you’d likely notice the difference on the top and maybe slightly when used as back and sides in place of Mahogany. But it’s going to be closer to Mahogany than it is to say Rosewood. To give some perspective the following is the hardness of the woods discussed here including Rosewood. This is the average hardness and an individual piece of wood will differ. Of course, this hardness isn’t the only thing that determines the sound qualities. But this does give a good indication of how Sapele compares to Mahogany as opposed to Rosewood. Another way to put it might be if you were to think of Mahogany as 1 on a scale of 10, and Rosewood was 10. Sapele would then be a 2 or 3. It wouldn’t be a 5. It’s not half way between Rosewood and Mahogany but it’s closer to Rosewood than Mahogany is, if that makes sense. 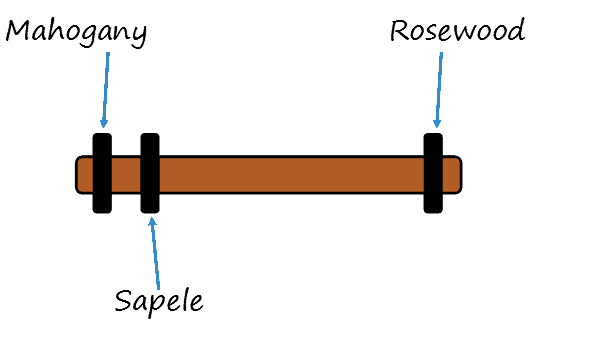 It’s closer to Rosewood than Mahogany is but it’s much more similar to Mahogany than it is to Rosewood. This of course doesn’t mean better or worse – it’s just to illustrate in terms of tonal characteristics how Sapele fits between Mahogany and Rosewood. Both Mahogany and Sapele have warm, mid-range-heavy tonal characteristics with subtle overtones. Sapele then adds some extra high end into the mix. They’re not exactly the same, tonally, but they are close. I hope this post has helped you to learn the difference in Mahogany and Sapele. What’s your experience with these tone woods? Can you notice the difference? Any other comments or questions welcome in the comments section below. This was a well presented education on the different qualities of different woods . I am thinking of buying a Talor gs mini and did not know if sapele was a real wood or a man made product( I know that sounds dorky but I never heard of the word before). Well done article. Glad the article could help. Sapele is definitely a real wood! It’s just not heard of as much as Mahogany. In fact some retailers sometimes even just say Mahogany, when it’s actually Sapele, just because less people have heard of Sapele. I, too, have only recently become aware of this wood. I am not a musician; I am a 3D enthusiast. I was looking for wood textures and came across sapele when looking for mahogany. Some sites referred to them as the same thing and they do look so very similar, but other sites claimed differences, so to be sure I googled sapele vs mahogany wood. Your site is third on that list. It was interesting to find this information about the sound qualities as well as some other qualities discussed here. A very well done article. It adds dimension to my ideas as to what projects to use these two distinct woods for. Thanks again for the helpful information. Nate, an excellent, succinct article on these two woods. As I’m about to buy an acoustic guitar I’ve sampled many different brands and models of guitars. After much thought , I finally arrived at the best combo of woods that I feel produce the best tonal sound for me and my style of playing, a mahogany top with Sapele back/sides. Although I’ve been a die -hard Martin guy, I find that Taylor is now producing some very high quality, affordable guitars. This article was very helpful in making my decision ! Glad the article helped with your decision and glad that you’ve found the tonewood combo that suits you the best. I agree that Taylor is making some really nice guitars. I was also more of a Martin guy before starting this website but over the last couple of years Taylor have become equals for me. Yeah it’s hard to know if yours is Sapele or Hog. They used those woods interchangeably for those models as far as I know. The only real way to tell would be b ya visual inspection if you were familiar with the how the woods differed in looks. Some people are good at distinguishing the difference. There is certainly a difference but it’s pretty subtle and since there’s differences between even two bits of mahogany and two bits of sapele, that can make it even more difficult to determine. In my opinion both are great tonewoods anyway and if you like the tone of your 000-15, that’s the main thing! Love the education. Bought my first uke and it was made a sapele and was curious what it was. I , too, in my ignorance was not sure if it was man made or natural wood. I am going to buy a concert uke made of mahogany just for kicks and I usually have tow of each instrument any way; one for playing seriously and another to travel with, taker to the beach, parties etc. Thanks for the message. Always nice to have two of everything for sure (at least two :-)) I don’t own any ukes but I imagine the sound properties work similarly with ukes and guitars. I ended up to your site, trying to understand the difference between sapele & mahogany, as I’m considering to buy an inexpensive nylon strung electroacoustic crossover guitar, and the 2 candidates are full sapele the one and full mahogany the other. Your article was very helpful and I will go for the sapele, since I prefer the sound of steel strings. Being a novice in guitar playing, I have not yet posted on guitars in my blog, but I believe this year I will. Glad you found this article helpful. Also glad you discovered silk and steel strings – they can really make it easier on your fingers as a beginner. I’ve been playing guitar for several years, and now I’m looking to get myself a Ukelele. This was the first time I came across Sapele Wood, and naturally I had some questions about it. Your article is really well done, and answers everything a musician would be looking for when they come across your page. Sapele just smells better. And fun to work. Thanks for the technical differences. I recently got a Martin Backpacker 25th edition. I realized that the 25th edition is made of Sapele both top and back, while the original Backpacker is made of Sitka Spruce and tonewood. Would you please differentiate the two woods and the effect the woods have on the guitar? Thank you so much for the information btw! very helpful. I too feel your article on the comparison of the two Woods is highly educational. Thanks for that! Are you familiar with this? Is it truly just a different type of mahogany or is it closer to a sapele? My cynical mind tends to think sapele has a negative reputation, deserved or undeserved, and now the name of Okoume as a mahogany is exotic enough for people to take a chance on it. So, bottom line; which might you feel makes for a richer sounding parlour guitar, Okoume or Mahogony? your information on both Mahogany and Sapele tone woods was very helpful. I am purchasing an online guitar with Spruce top, Sapele back and sides. Don’t yet know the acoustic resonances and vibrations on this guitar. I am hoping for sound quality similar to Taylor guitars.